The Genesee Sun is a news source for Livingston County, New York. Conceived and launched in 2011 as a solely online and intensely local newspaper, the Sun’s income is dependent on web subscriptions and advertising. Their clever use of Leaky Paywall helped them with their subscriptions. Online advertising, on the other hand, is a tricky proposition. Readers actively block pop-ups and banner ads and the ones they don’t block, they typically ignore. The average clickthrough rate for banner ads is a low, low .05%. The Genesee Sun needed a form of advertising that would interest the reader, get results for the advertiser, and successfully fund their continued mission to bring fast, accurate, local news to upstate New York. They found their digital advertising solution in ZEEN101’s LiveMarket. LiveMarket allows local organizations to generate and immediately post short ads for a small weekly fee. Headline links to those ads appear in a dedicated section – called Sun Beat – on each of the Sun’s pages. 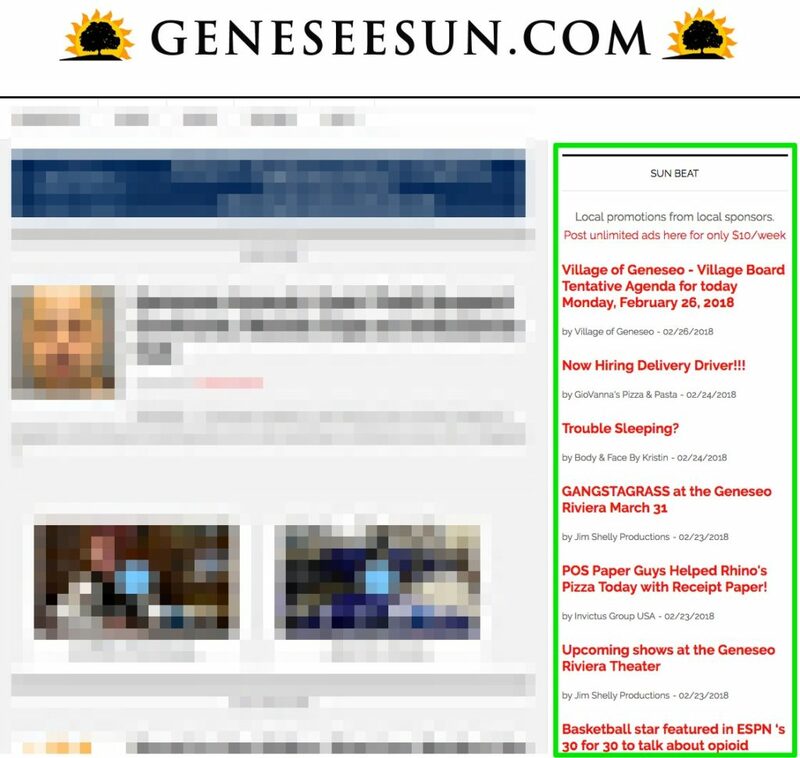 Sun Beat is clean, scannable text, the ads are easy to create, and Genesee Sun readers have instant access to information on local events and promotions. The Genesee Sun has seen amazing results across the board. For the publisher, it’s a strong source of hands-off revenue. The number of advertisers is well into the double digits and they’re shooting for 100 this year. At their current rate of $10 a week (and factoring in ZEEN101’s percentage), 100 advertisers would bring in over $36,000 a year… and it’s self managed by the advertisers. Keep in mind next year may see a $20/week LiveMarket fee. And they haven’t found it difficult to collect advertisers. In addition to local businesses, the Genesee Sun has tapped into an extra market: municipal government. Many states require certain legal notices to be publicly posted for a length of time, New York among them. LiveMarket satisfies that requirement. Local governments join restaurants, music venues, barber shops, real estate agents, and more as frequent Sun Beat contributors. says Genesee Sun General Manager Josh Williams of Sun Beat. That sale is made easier by the results for advertisers. The clickthrough rate for Sun Beat is almost 5% – more than ten times the average for banner ads. Plus, individual advertisers have reported concrete responses. says local businessman Greg P.
The experience of the Genesee Sun proves that LiveMarket is a valuable tool for local and niche publishers, the advertisers who need them, and the communities that read them. Want to find out how LiveMarket can help you? Let’s talk.